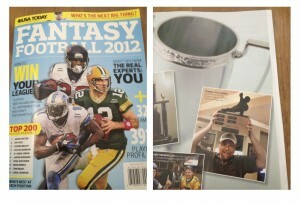 Congratulations to Frank Little of the All World Fantasy Useless League (AWFUL) for being selected by THE USA TODAY to be featured in their fantasy football magazine. As you can see, the Throwback made it in their as well. Pick up the magazine at a news rack by you and I think you’ll agree with me, those other trophies look pretty damn lame next to Frank’s. Next post: Which Fantasy Football Trophy Should I Buy?